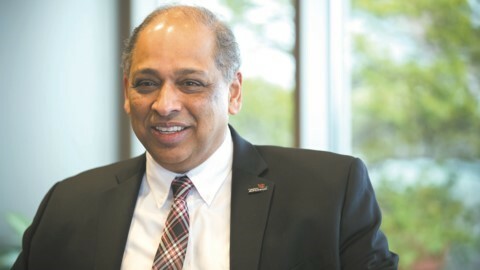 This article was written by Uptown Consortium Chairman and University of Cincinnati President Neville G. Pinto, PhD. It’s been fourteen years since the leaders of the University of Cincinnati, UC Health, Cincinnati Children’s Hospital, TriHealth and the Cincinnati Zoo came together as the Uptown Consortium to collaborate to improve the lives of all of those who live and work in the Uptown neighborhoods. The Uptown Consortium (UCI) continues to achieve that mission by growing our neighborhoods through the power of collaboration and leading the way for economic development and community advancement in the Uptown region. UCI has accomplished a lot in fourteen years, including developing U Square at the Loop, renovating old St. George Church with Crossroads, and advancing several residential and commercial developments that changed the landscape of our neighborhoods. We accomplished this while prioritizing partnerships with the community and the City of Cincinnati to ensure new developments were in the best interest of the Uptown Community. While we have reached many milestones in our time, we’re showing no signs of slowing down. We won’t slow down because we believe that we can continue to improve and achieve great things for our region’s 51,000 residents and 43,000 students. The work of the Uptown Consortium continues because we truly believe that our unique mix of established neighborhoods, new construction, anchor institutions and diverse businesses add up to a region with the most dynamic potential in the entire Midwest. This has been proven over the past year alone. After nearly a decade of advocacy and planning, the I-71 Interchange opened in August, creating a world of possibilities for development, project investments or catalytic development in Uptown. This $80 million infrastructure project dramatically improves connectivity between Uptown Cincinnati and the rest of the Greater Cincinnati area. With the completion of the interchange, Uptown Consortium started executing plans for a world-class Innovation Corridor. To be filled with pedestrian-friendly, mixed-use developments, the Uptown Innovation Corridor will leverage the core strengths of Uptown anchor institutions—medicine, research and innovative advancements—to attract high-growth, tech and creative companies and the people they employ. We saw this idea come to life in 2017. In January, Terrex Development & Construction and Messer Construction announced their intentions to build a $200 million mixed-use development located at the I-71 Interchange, Uptown Gateway. The University of Cincinnati started construction on two developments in the Innovation Corridor—the 1819 Innovation Hub, a $38 million renovation of the former Sears department store into a research accelerator, and the UC Gardner Neuroscience Institute, which will be the leading regional treatment center for complex neurological conditions. In July, the National Institute for Occupational Safety and Health (NIOSH) announced their intention to consolidate their three Cincinnati facilities into one $110 million facility in the Uptown Innovation Corridor. And in the fall of 2017, MLK Investor I LLC, a partnership between Neyer Properties and Kulkarni Properties, unveiled plans to develop a $250 million mixed-use development in the Corridor. In the Uptown Innovation Corridor alone, we have the opportunity to create and retain more than 6,000 jobs and more than $600 million in project investment. The long-awaited Corryville Kroger opened last spring bringing fresh groceries and a fun urban design to the residents and employees of Uptown. We announced our new partnership with MORTAR, an acclaimed urban entrepreneurship program, to bring their business training classes to the Uptown neighborhoods. In August, MORTAR graduated 20 entrepreneurs from their classes in Uptown and in the West End. We continued our partnership with WEB Ventures, our diversity and inclusion consultants, to advance our mission to prioritize jobs and economic opportunities for minorities and Uptown residents. In 2018, we look forward to keeping our momentum. We hope to see new developments and tenants announced around the Uptown Innovation Corridor as well as in other areas of Uptown. The Uptown Consortium and our development partners will continue to prioritize job opportunities for Uptown residents with more training and job placement programs, so that as developments grow, so does the prosperity of our neighbors. We will strengthen our partnerships with the community councils and the City of Cincinnati, so that all stakeholders are included in every step of the planning process. Above all, we will continue to work towards a common goal: developing a healthier, innovative ecosystem in Uptown Cincinnati. Interested in learning how the Uptown Innovation Corridor’s five newest developments are positively impacting our economy? Check out the infographic below. Few areas experienced the type of milestone moments like Uptown did this past year. From the opening of the new MLK interchange to the unveiling of the unprecedented Uptown Innovation Corridor, the five neighborhoods of Uptown created transformative events. Uptown Gateway is the first large-scale joint venture between Terrex and Messer. Aligned with Uptown Consortium’s vision, the Terrex/Messer team has integrated into their planning inclusion and minority-driven results. Throughout Uptown Gateway’s development process, Terrex/Messer is designing opportunities for minority-owned businesses and contractors, sharing ownership in everything from engineering and construction services, to investment and workforce opportunities. This planned development will include a mix of commercial, hospitality and residential uses. Site planning and design work is underway on the first phase of this multi-phased development. The site is advantageously situated with visibility and access from the new ramp. The development team plans to use the site’s unique (or challenging) elevation grade changes to their advantage. On Martin Luther King Jr. Drive East between Eden and Bellevue avenues, the $60.5 million project is underway, and based in part on some unique research. UC leadership and architects from Perkins+Will met numerous times with patients and their families to gather insight to create a patient-focused facility that aids in the [JH1] healing process. While it’s not unusual to gather patient research, meeting with families is an enviable strategy for healthcare facility design, and likely a model for similar projects. This $35 million, 60-unit apartment building renovation at 2309 Auburn Ave will rent from between $1.70 and $1.80/square foot. Before purchasing the property, NAP learned that the site held an orphanage from the 1800s through the 1920s. Specialists will be brought in to clean and restore the original iron fence, stone wall and stone entrance pillars. Many of the natural elements and colors that embody the stone quarry adjacent to Inwood Park will be reflected in the building’s interior design. Within the One41 development (see above) Highland Park will feature ten single-family units and a house with garages (which are unique in a dense urban environment). Additionally, rooftop decks will add to the properties’ value with views to the east and the south. Each home will sell for between $325,000 and $400,000. This long-awaited redevelopment of the Town Center at 3635 Reading Road is part of Reading Road Corridor’s multiphase transformation. More than 30 percent of the 80,000 square foot, $50+ million construction spend will be invested with minority-owned businesses. Originally opened in 1929 at 2900 Reading Road, this 133,000 square foot building was home to Cincinnati’s first Sears, Roebuck and Co. store, and was the first large department store outside the downtown area. It was among the initial wave of Sears stores after the Chicago-based company opened its first large retail site in 1925 and was designed by Chicago architectural firm Nimmons, Carr & Wright. Many of the original architectural elements are being maintained while marrying futuristic elements that will house UC Research Institutes’ rigorous R&D. The Avondale Community Council rescued this former Golden Age Nursing home building at 3635 Reading Road, which stood empty in blight and disrepair for several years. The $1.6 million building renovation was completed in October 2017. This year, the second phase of the renovation will include completion of the commercial kitchen for food entrepreneurs. More than 40 subcontractors are involved throughout the $87 million Fifth Third Arena renovation, and the project hosts an average of 150+ workers on site daily. More than 1,500 square feet of the original wood floor has been salvaged for reuse in the project, and 450 tons of existing stone roof ballast was removed and recycled to make way for the new roof. While not technically a member neighborhood of the Uptown Consortium, we applaud our neighbors at the Walnut Hills Redevelopment Foundation and their work at DeSales Corner in East Walnut Hills. The Central Trust Bank Building transformation at 1535 Madison Road employs a Walnut Hills-based company, Valley Interiors, LLC, to restore the building’s historic plaster art deco ceiling and light fixtures. Experts have built replica molds to cast new plaster ceiling tiles and wall sconces to restore the interior plaster components to the original style and condition. The building was built in the 1920s, but hasn’t been occupied since the 1960s, so the restoration is time, material and labor intensive, but certainly worth the investment.